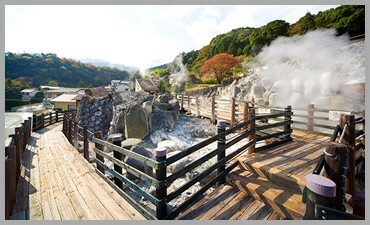 In the hot springs village of Myoban, faraway Beppu Bay spreads out beneath your gaze. Five minutes by car from the Beppu IC on the Oita Expressway, or five minutes by car from the Beppu Bay Service Area Smart IC (ETC-only Gate). Faraway Beppu Bay spreading out in the scene before you. We are a well-established Japanese inn standing at the foot of the historic Myoban hot springs village. At Myoban Onsen, with the faint smell of sulfur floating about, is a well-established Japanese inn that carries on traditions passed down from the Meiji era (the late 1800s). Within the nearly 4,000 square yard garden, beautiful through all the seasons, lies a soft, celadon-colored outdoor hot spring bath. The hot spring at Okamotoya is Myobansen, praised as having a higher medicinal efficacy amongst the eight hot springs of Beppu. Loved by those seeking to take to the baths for medicinal purposes, Okamotoya has continued to provide comfort to many people throughout the generations. The pride of the inn, the hot springs and the food, as well as the tranquil nature. Forget the hustle and bustle in an atmosphere that makes you feel history itself. The warm hospitality of Okamotoya is here to let you relax. Copyright (C) 2013 OKAMOTOYA-RYOKAN. All Rights Reserved.